The Awasha Ghanian boat “The Lord”, owned by a Benin man called Alfred, is departing early morning from Yoyo beach. 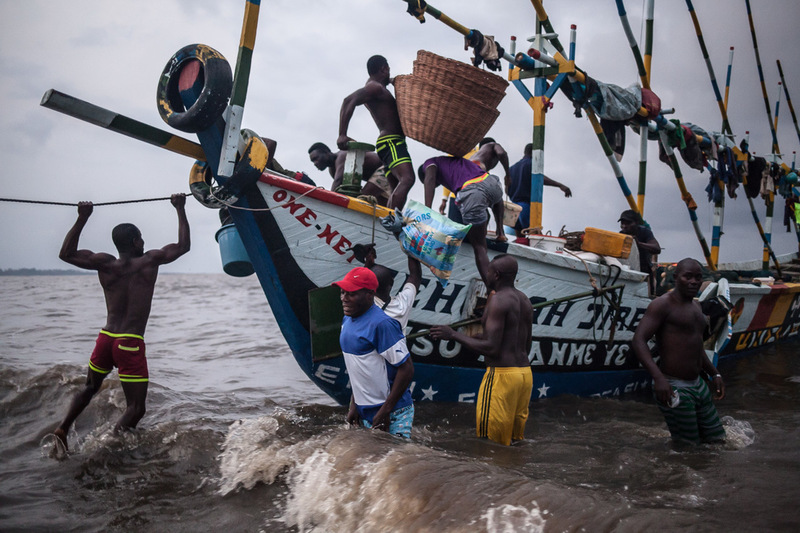 It will try fishing in the sea near, but if the catch is too little, it will move to an other West African fisherman’s camp next to Limbe, in Cameroon. 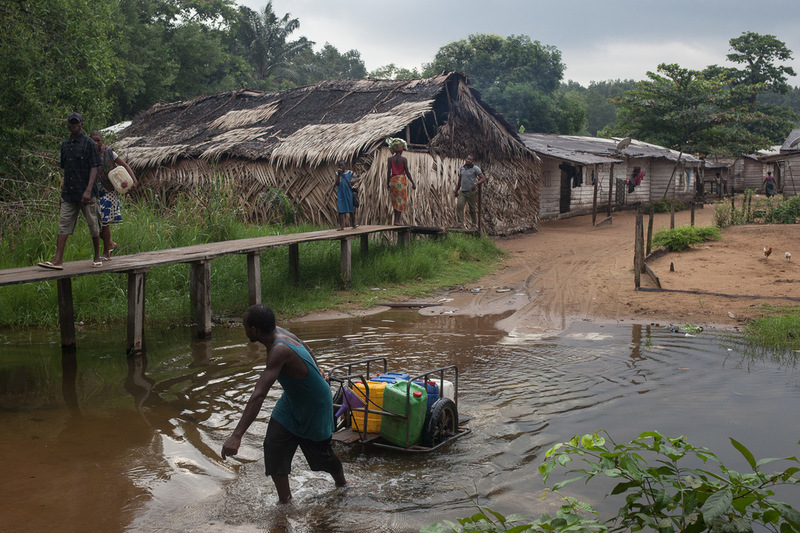 A man crosses a small water plan in Yoyo village. 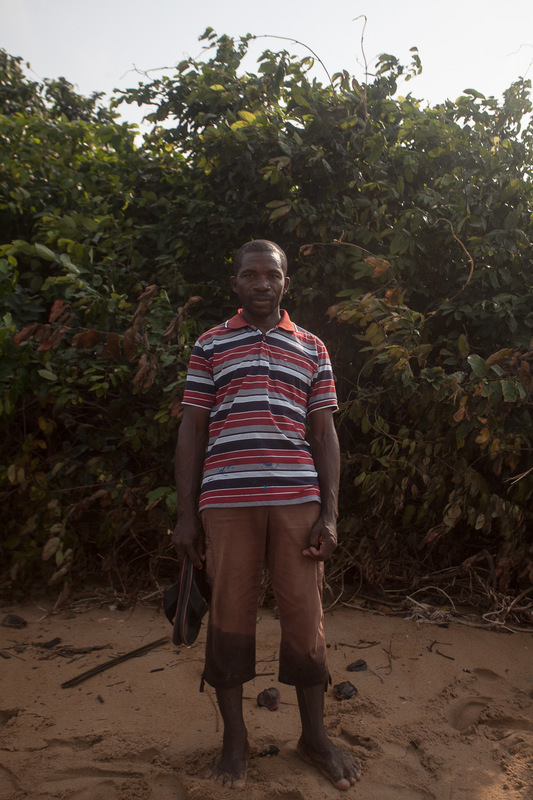 Mister Alfred, a 47 years old fisherman working since he is eleven, poses for a portrait on Yoyo beach. He is Ghanian but was born in Benin. There, he owns a house, fields to cultivate, apartments to rent and fish farming space. 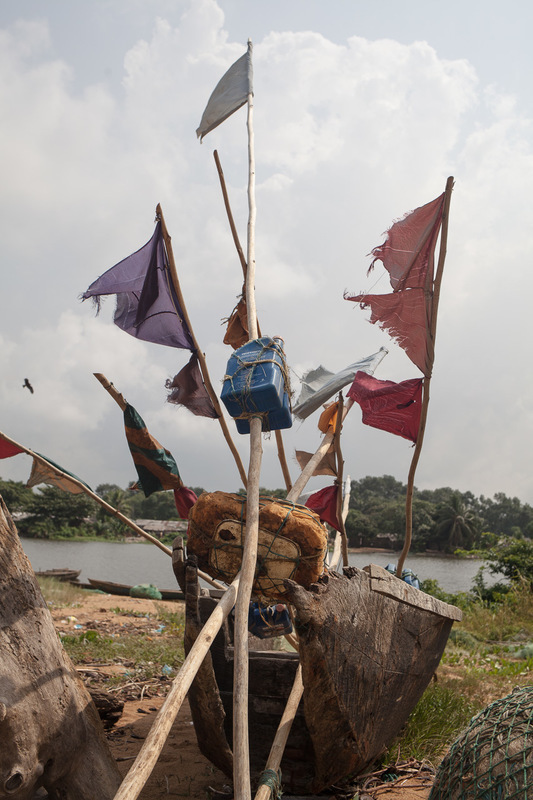 As he owns a boat in Cameroon and one in Benin, he spends his time between the two countries. 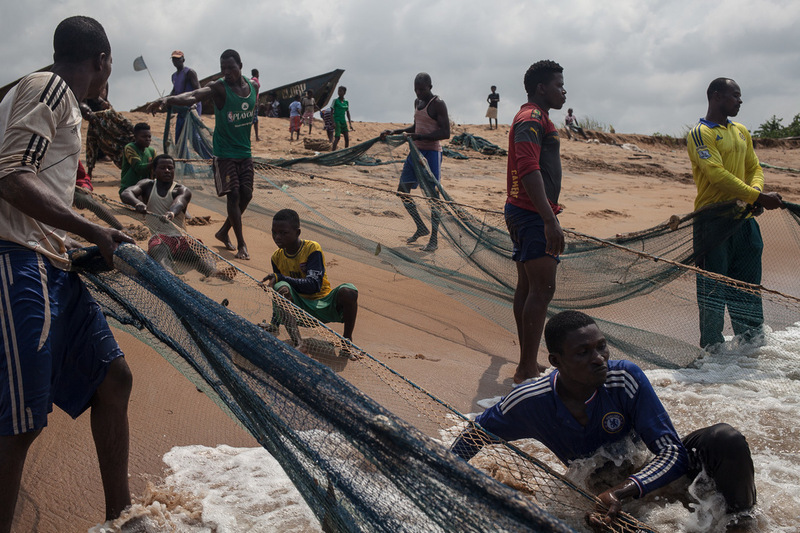 A group of fisherman participate in the dragging of a semi-circular net from the "Kasava field" beach. The big boats did not leave because the sea was bad, so fisherman do this to have a couple thousand francs and some fish to eat for the day. The technique consists in having a boat throw the net deep at sea, while two groups on the beach drag the ends of the net together. At the tip of if, a part is tighter and captures the fishes. That day, they did not catch much and were too many than necessary. 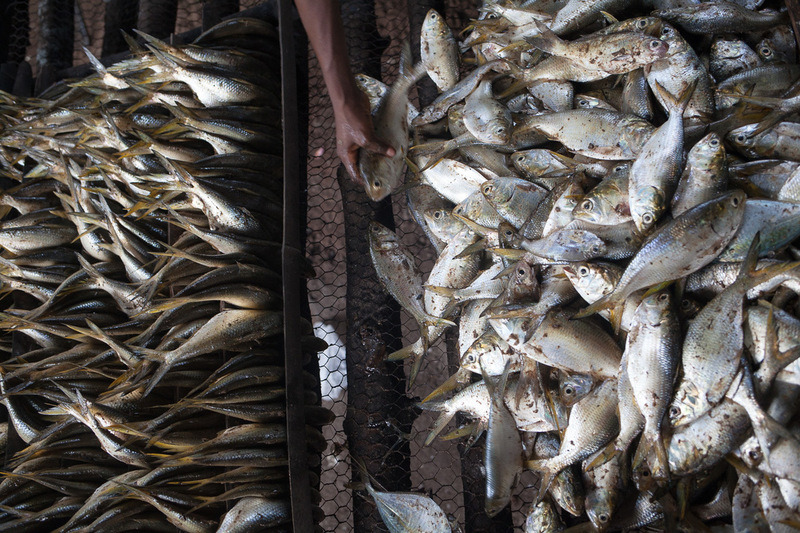 They all left with around 5000 XAf after the fish was sold and the money was split in equal parts. Fisherman split and count the fishes from their daily catch after dragging a net from Yoyo beach. Nigerian Boats on the beach called “Kasava Field”. On the other side of the small bay is Yoyo village. 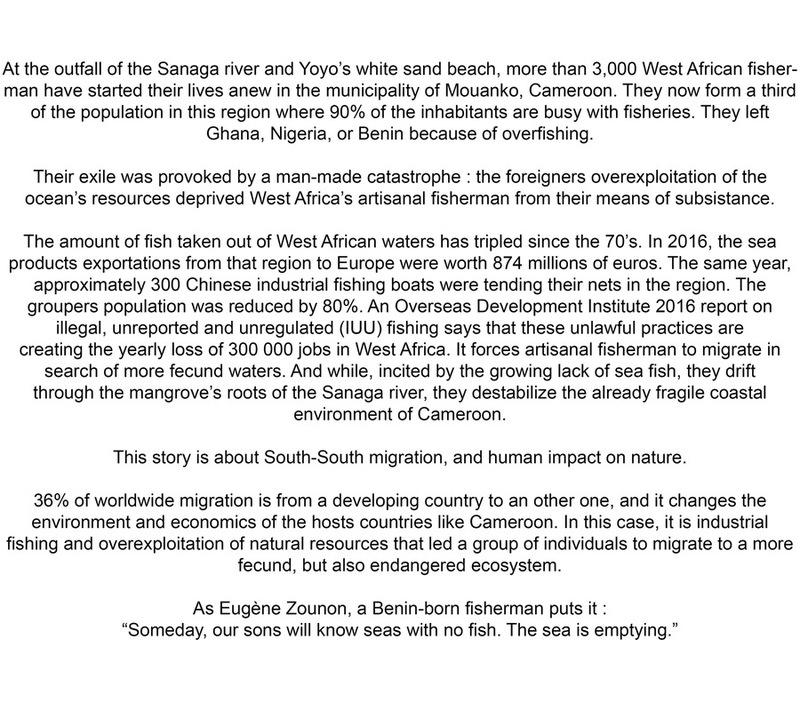 There, West Africans from mainly Nigeria and Ghana have established a camp, to fish in the less exploited waters of Cameroon. 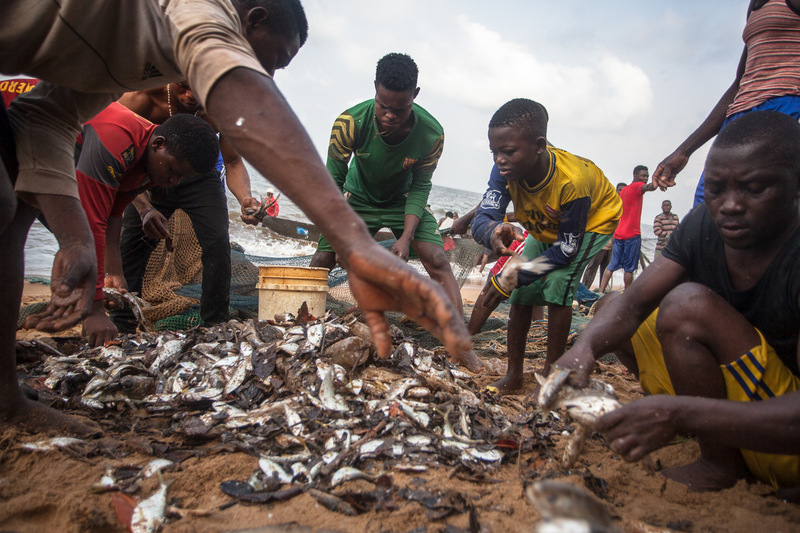 They have introduced their artisanal fishing techniques, catching way more fishes than with the traditional basket and small pirogue fishing that Cameroonians use. 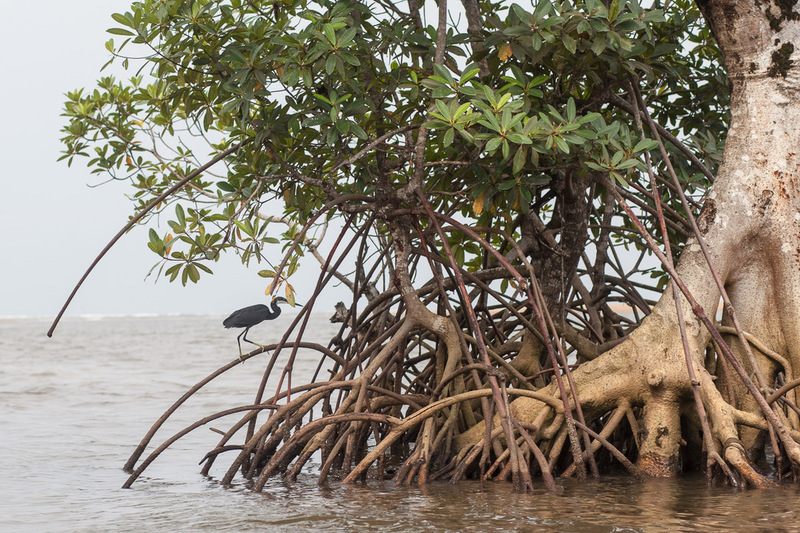 A remaining mangrove between Yoyo and Mbiako. It used to be full of mangroves. As the mangrove surrounding Yoyo and Mouanko is being cut to smoke the fish, and to cook, Nypa Fruticans slowly takes over the mangrove forest zone. It has less positive effects on the environment than the plant is it outrooting. 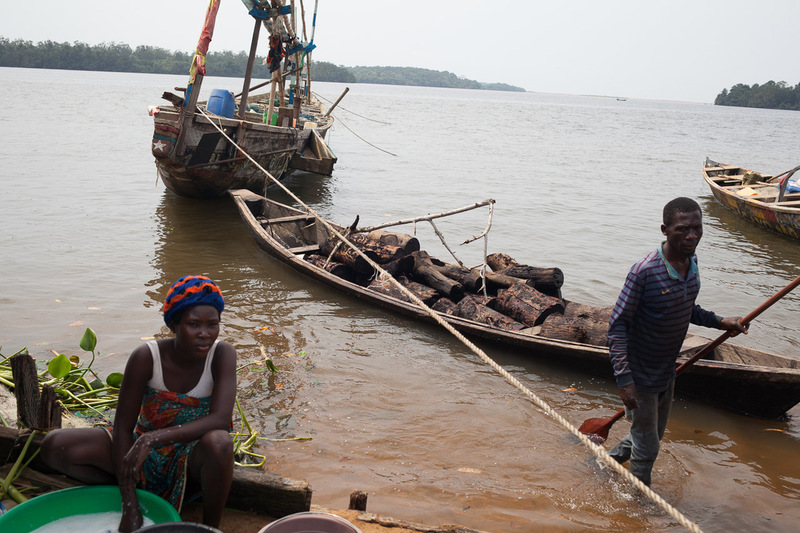 In Ebokombo, a man and a women arrive with a dugout boat full of red mangrove wood, that they call Caltal, and use to smoke the fish. The Mangroves around the West African fisherman camps being cutout by this activity. Bebe is from Lagos, Nigeria. She came to Yoyo, Cameroon with her husband and four children. She crosses from the Kasava field beach to Yoyo village to go smoke the fish catches by her husband that day. 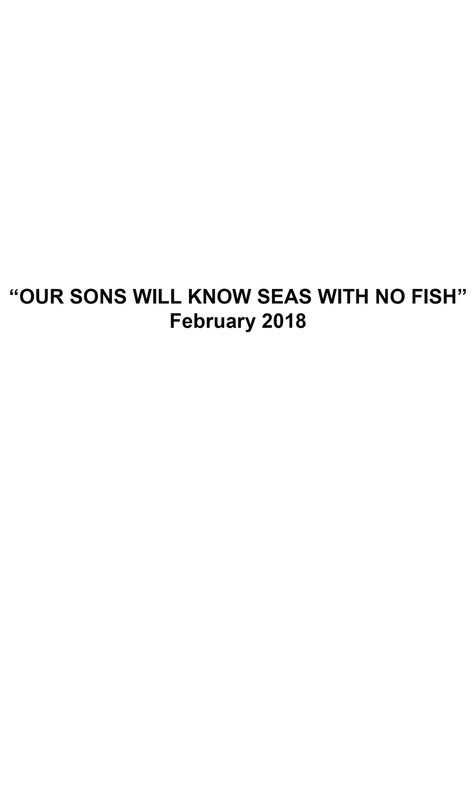 6 fishes will be sold a 1000 XAf. To have the right to have a kitchen, she pays 40 000 XAf a year in taxes to the Cameroonian authorities. 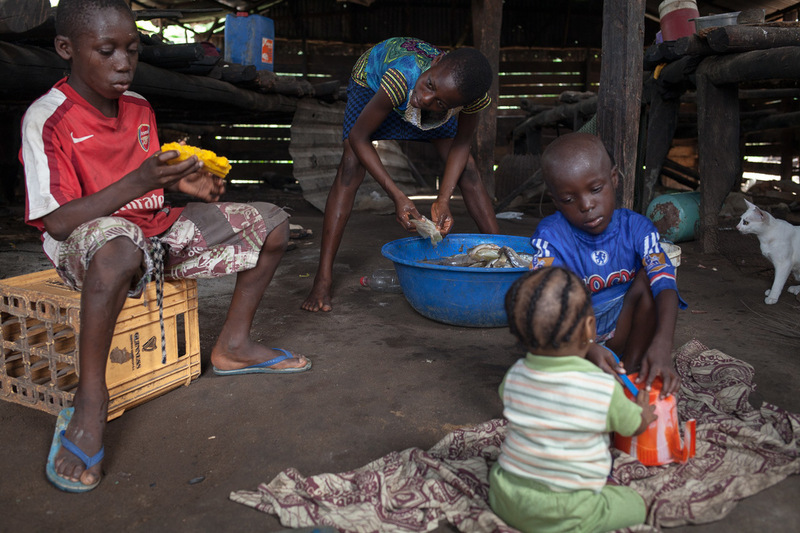 Patricia, Bebe’s daughter, washes the fish before smoking it, while her brothers and sister play in their kitchen. The different kinds of fishes are separated before being smoked. Patricia, Bebe's daughter helps her. In the high fishing season, she can earn a couple thousands when she goes to help other woman than her mother. 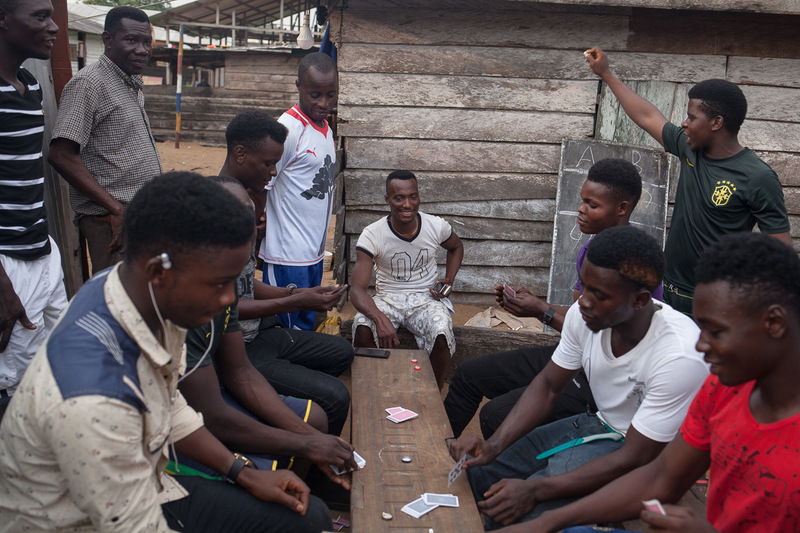 The fisherman from Jupiter company, owned by a man from Benin, play cards at night. They are all housed and fed at night by the company. If someone is hurt or get sick while at sea, the hospital fees are paid by the company. 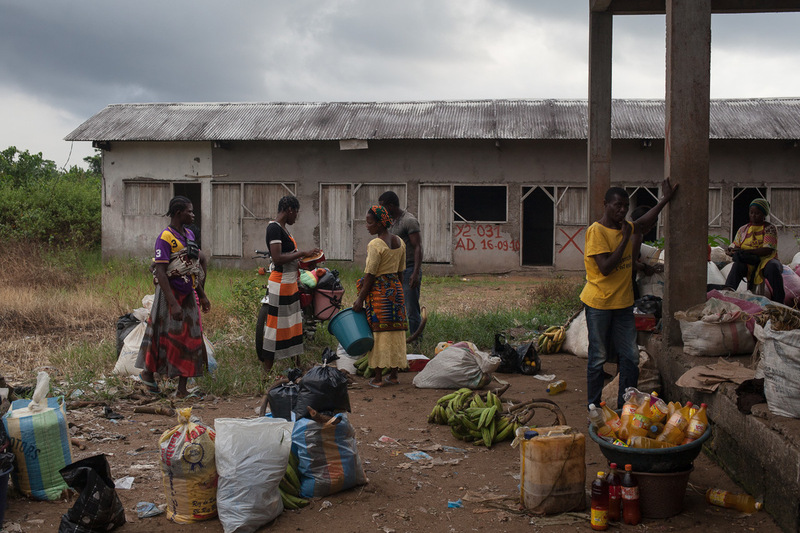 Twice a month, Cameroonians from the vilages surrounding Mouanko's municipality come and sell farm products in Yoyo's market. Some of it is not sold for money, but exchanged with smoked fish. 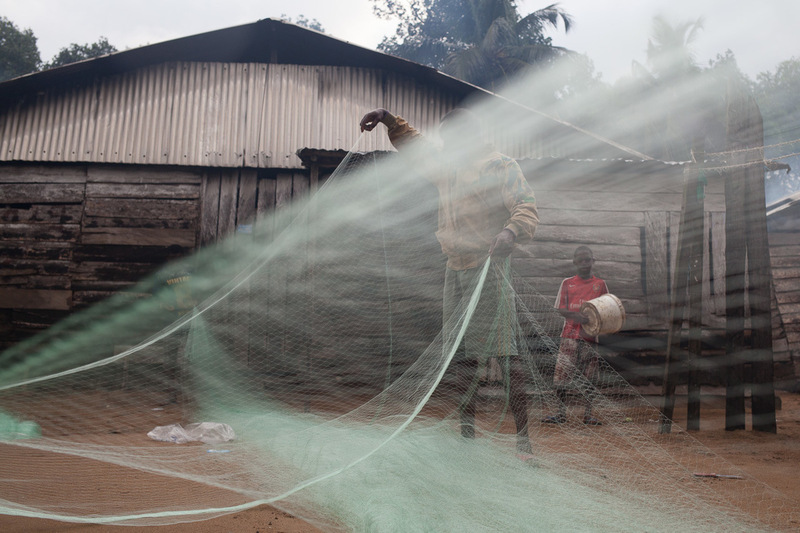 Man prepare tight nets for fishing in Yoyo. That type of nets catches everything, without distinction.